Perched on the water's edge, The Overlook offers commanding views of Merriconeag Sound to Casco Bay and its islands. You'll find yourself waiting to watch the sunset every evening, as the sky is painted with stunning hues and the soft light fills every room. The Overlook offers multiple decks with plenty of seating for dining outdoors or simply relaxing by the sea. Beautiful gardens and trees surround the property, offering great privacy, while being within walking distance to all Bailey Island has to offer. Inside you'll find a well appointed kitchen with everything you'll need to prepare a delicious Maine meal, a beautiful dining room area with two sliding glass doors opening to the deck, and a spacious living room with comfortable furnishings, panoramic ocean views, and a woodstove for chilly nights. The first floor also offers a bedroom with a queen bed and ocean views, as well as a full bathroom with a laundry area just outside. On the second floor you'll find two additional ocean view bedrooms with queen beds and a shared full bathroom with a tile shower. Hardwood and tile floors throughout, modern coastal decor, and an abundance of natural light completes this seaside retreat. 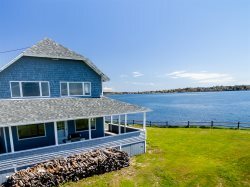 Conveniently located in the West Shore neighborhood of Bailey Island, you'll love being just 0.5mi (8-10min walk) from all of the island's great local restaurants including Cook's Lobster & Ale House (serving lunch and dinner), Morse's Cribstone Grille (serving lunch and dinner), Giant Stairs Seafood Grille (serving breakfast, lunch, and dinner), and Bailey Island General Store (convenience store). Spend your days relaxing by the sea, exploring the shore, catching the Casco Bay Lines Ferry from Cook's Lobster & Ale House for a cruise to Portland, sailing on Schooner Alert (also leaving from Cook's), or soaking up the sun at Cedar Beach (1mi away) and come home to experience the gorgeous sunset over the bay. The Overlook is the perfect vacation destination and will surely have you coming back for years to come. The Overlook on Baileys island , Harpswell Maine. Beautiful sunset rise and sunset , view, kitchen, just awesome! Everything was just perfect . Definitely recommend to any family to rent this beautiful home with all the amenities . We will be booking this house next year , its just like home. The name says it all - the Overlook is perched above a quintessential bit of Maine coast. It has all the comforts of home and a view to die for. If you are looking for a true Maine experience in a heaven on earth location, this is it. The Overlook was well appointed, comfortable and well stocked. The sunsets were magnificent. Even though there are other homes nearby the landscape made it a very private oasis! This is simply a lovely home in a beautiful setting. Very private with two decks overlooking the water, a great outdoor eating area and views of amazing sunsets. The kitchen is fully equipped. There wasnt a thing we needed that wasnt provided. Bedrooms offer spectacular views of the ocean, the moon, and early morning fishing boats. Beds are so comfortable- we all slept well. We wouldnt consider staying anywhere else next time we come to Maine! The place was perfectly clean, the furniture, colors, and linens all added to the sense of quiet and peace. We sat on the deck or ate at the dining room table and always had views of the water. Great restaurants nearby for eating out.